Rice production in Australia has been based around the Murray River since a demonstration 200 acres was developed in 1908, with the first commercial production beginning in 1924. 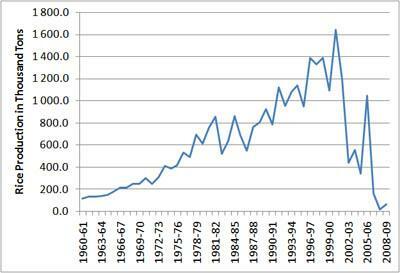 Australian rice production rose to a peak in 2000. However, droughts since 2000 resulted in production dropping to 14 700 tonnes (t) in 2008. This along with reductions in water allocations from the Murray Darling irrigation systems forced the rice industry to look for ways to reduce water use and obtain greater yield per megalitre (ML) of water. The ongoing impact of this water shortage is highlighted by the 2016 Riverina rice harvest being 245 000 t compared to 690 215 t in 2015. Nationally, the rice industry has a target production of approximately 1.3 million tonnes per year. Rice production in the NT will require close support from, and collaboration with, the greater Australian rice industry. As we develop a rice industry for northern Australia it is important to maintain linkages with SunRice, the major Australian agribusiness in rice breeding, agronomy, extension, processing and marketing. NT DPIR has a long and ongoing relationship with NSW DPI and SunRice in the variety screening work undertaken at Tortilla. This trip to Yanco reinforced that relationship and has the potential to develop future work in rice research in the Top End. The rice meeting held at the Yanco Agricultural Institute, brought together over 50 rice growers, researchers, agronomists, millers, rice industry stakeholders, and RIRDC research managers. It was important for seeking research directions for aerobic rice agriculture in both southern and northern Australia. Southern Australian rice is typically grown as paddy rice and can use up to 24 ML of water per crop. Though on average, Australian rice growers yield 10 t/ha and achieve the 1 t/ML target. Of the many issues raised; new varieties to suit the aerobic systems was a common request. Other topics for research raised included: decision support systems for when to water, new varieties (drought and blast tolerant lines), weed control and crop rotations, precision tillage, fertiliser placement and fertiliser form, nitrogen transformation and availability of nitrogen in the soil under wetting and drying conditions, soil chemistry and soil health, and increased labour requirements with increased irrigation demands. The meeting also discussed research results of various RIRDC funded projects in the rice sector. Topics ranged from weed management and new herbicides, through breeding, irrigation, nitrogen processes, remote sensing and data collection, using microwaves to kill weeds and weed seeds in soil. Of interest to the NT was a discussion by several presenters around the use of plant growth regulator MODDUS® (by Syngenta, active ingredient Trinexapac-ethyl) in various studies. One set of experimental data indicated variable impact on yield with significant yield increases at only one of three sites. MODDUS is not yet registered for use on rice.